I just got my November Stitch Fix box this Saturday and at the time I'm writing this post, I'm still trying to decide what to keep and what to send back. I'm having a hard time because I love everything! I created a poll on my Instastories on Instagram and I would really appreciate it if you'd pop on over there and vote on each item. The poll should run through 3:30 central on Monday. I don't need to decide what to keep until Tuesday, and I will really be taking whatever you guys say into consideration. So please vote! And of course you can leave your opinion of these three pieces in the comment section below this post. In this Fix I received a vest, a sweater, a necklace, a pair of skinny corduroy pants, and a bell sleeve top. Today I will review three of those pieces: the vest, sweater, and necklace. On Friday I'll review the last two pieces and then do a review of the entire Fix and let you know what I kept and what I sent back. The first item I will review is this vest. I'll be honest and admit I sneaked a peek on the Stitch Fix website to see what they were sending me in advance. I try so hard not to do that, because I really liked to be surprised, but sometimes I just can't help myself. When I saw I had a puffer vest in my Fix I initially thought "Oh no, I don't need another puffer vest. I already own five!". But then when my Fix arrived and I pulled out the vest I was blown away. It is so well-constructed! It's one of those items when you examine it you realize you definitely get what you pay for because the quality is amazing. I'm normally not a big plaid lover, but this plaid is so subtle it works for me. I like the colors in the plaid. It has a tiny bit of burgundy in it which really works for me because I have a lot of burgundy in my closet. 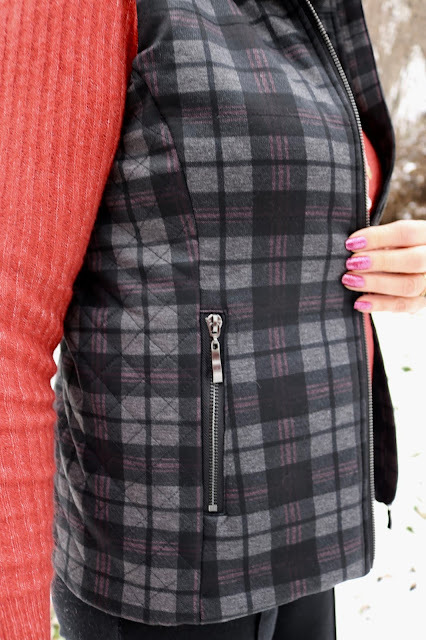 It is very tapered, so even though it's quilted and thick, it's very slimming for a vest. It doesn't feel or look like it adds a lot of extra bulk to my frame. It has side pockets with zippers! Yes, another plus for me! My husband really liked the vest too, and feels I should keep it. He says I don't have anything like it, and he's right, I don't. He liked the quilting as well. The next item is this necklace. I like the style of this necklace but the quality of the necklace is kind of cheap for the cost. I could find something similar for half the cost or less at Charming Charlies or elsewhere. I will probably only keep the necklace if I keep the entire Fix because it is pointless to send only the necklace back and lose my 25% off discount. The third item in this Fix is this burnt orange sweater. Things I love about this sweater: the color, the thin knit, the length. Things I don't love: the crew neck and shoulders don't flatter my figure. I also have two similar colored sweaters in my closet already. The two similar sweaters I already own are slightly different. One has a lace up neckline (HERE) and the other is a thicker knit and shorter (HERE). I prefer this Stitch Fix one over the thicker, shorter knit one I already own. This happens a lot to me with my Stitch Fix items. I already own a similar item, but I like the one Stitch Fix sends me better, and I want to keep the Stitch Fix item, even if I really don't need it. Ugh! That's why I need you to help me decide! I'm actually not a big fan of pullover sweaters in general because I never think they flatter me. I always prefer tops with cardigans or vests. But, living in Wisconsin, pullovers are often necessary: as you can probably tell by these photos. Yes, we have snow already. This is actually our 4th snowfall this season. It's going to be one long, miserable winter. I'd really love your thoughts on these items! I don't have to decide till Tuesday, so please advise me! I'll be back on Friday with the other two pieces of this Fix and I'll let you know the results of the poll on Instagram and also what I ultimately decided to keep. Have you always wanted to try Stitch Fix but you were a bit nervous about it? Did you know if you use my Referral Code you can save $25.00 on your first Fix? Give it a try! What do you have to lose? I love the color of the sweater, but like you I am not a fan of the high neckline (although I do love the pullover styles). I'd keep it if the fabric was very comfortable around the neckline. It does look nice with the vest. 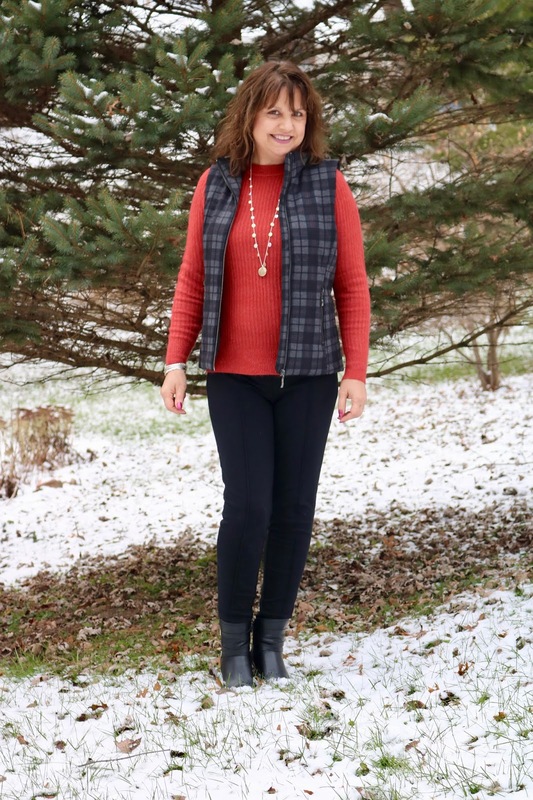 About the vest, I think the pattern is unique and it doesn't look bulky like some other vests I've seen, and it looks like you could even wear a winter coat over it. Since you do like to wear vests, I'd say keep it. The necklace I'd probably also only keep if you kept all pieces. It's pretty, but it sounds like it is a bit expensive, and I personally only buy expensive jewelry if they are gold or silver. Not sure if this one is. Thanks Ellie! You really helped. The neckline of the sweater drives me crazy. It is comfortable, but it's just not flattering on me. And like I said, I actually have two sweaters in this color already, although the styles are different. I so agree with you about the vest, and I CAN wear a coat over it, which is a huge plus. The necklace is around $35.00, which isn't really expensive, but it seems really cheaply made for that price. The chain is super thin. That vest is definitely a keeper Amy. I like that's it's not that puffy like some vests are, and the fact that it's plaid, you don't even notice some of the quilting until you get close. And it fits you perfectly. Thanks Jodie, right now I'm pretty sure I'm keeping the vest. It's just too unique and well made. The sweater and necklace will most likely go back. Hi Amy, I couldn't find your Instagram do you have it linked up here to your blog? Anyway, I agree with you on the orange sweater. The neckline comes up awfully high. The vest looks like a nice quality. thanks Kim, the link to my Instagram account was in my first paragraph but you probably didn't see it because it wasn't highlighted. I've since corrected that. The polling is over now, the top and pants (not shown in this post) came in on top. Absolutely yes the vest...that could be a TV show...Say Yes to the Vest! If you aren't crazy about the sweater, I feel certain you can find something you like better for less than what I imagine Stitch is charging for this one. And the same with the necklace. You wear it well but it isn't so unique you can't find something similar that you adore. YES YES YES to the vest! Leslie, you are always so funny! I'm afraid though you will be disappointed on Friday when I reveal what I kept and what I returned. It was my hardest Fix ever to decide. I ultimately made the decision on what I would actually get the most bang for my buck. I think the necklace is pretty and I'm not sure the cost of it but I know you could find something like that for cheaper I'm sure. The pullover is really pretty on you and I think it flatters you actually. I do think if you don't feel fabulous in it it should go back. Thanks Ruth. I agree about the necklace, I know I can find something similar for a lot less elsewhere. The pullover I was torn about. I didn't feel fabulous in it, although there were aspects of it I liked. The vest wrapped up the look dear, so cozy with the red sweater. 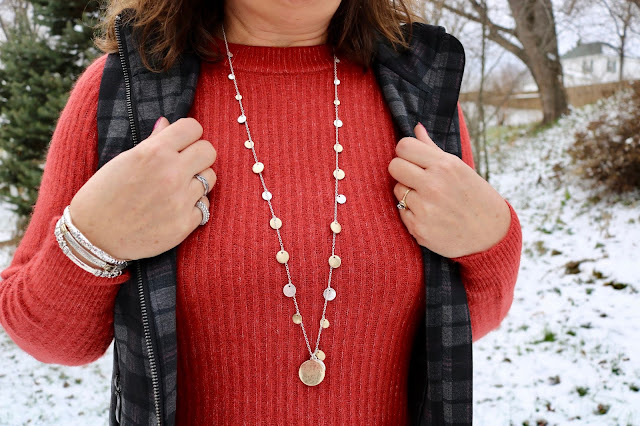 I love the details on the necklace! But you're right, you might be able to find something similar at Charming Charlie or Francesca's. That vest is super cute and you look so pretty in red! I love this vest! It will go with so many great colors; pink, royal blue, obviously red, black...endless! I think you could even pair with a cute gingham pattern. THanks for linking with The Blended Blog Amy! Thanks Shelly! It is so cute isn't it? I love it with the brighter color sweater too. I'm glad my stylist suggested it. That vest is so cute, I love it. It makes a great casual holiday outfit with that red sweater underneath. Thank you. I didn't think of that, it would be a great casual holiday outfit. I really like the vest, it's such a good fit, and the zipper pockets are a lovely detail. THanks for linking up! Thanks Emma, sadly, I returned the vest as it cost a lot of money and I wasn't sure I would get a much use out of it. But I'm glad I did because another reader pointed out that the plaids didn't match.